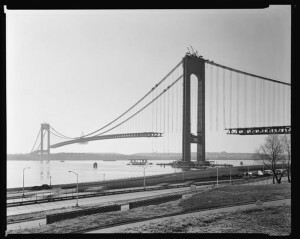 Giovanni da Verrazzano, who explored the shores of the North American continent in 1524, might have lent his name to the bridge which became the George Washington Bridge, a few decades before the Narrows Bridge was completed. The suggestion was made by a Newark resident and was at least passingly considered that the New York Times ran an article about it: “WOULD NAME NEW SPAN VERRAZANO BRIDGE.” The article casts aspersions upon the notion that the explorer would ever be seriously considered enough to warrant his own bridge. 3) What’s In A Name? Tanto! 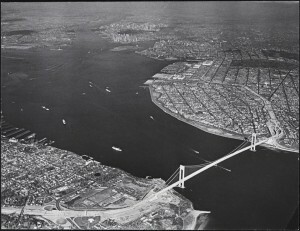 The Florentine explorer had much symbolic value to Italian New Yorkers, and in 1960, the Italian Historical Society of America managed to convince Governor Nelson Rockefeller to apply the name to the brand new bridge about to go under construction. Even then, there was some debate about the proper spelling of the explorer’s last name — Verrazzano or Verrazano. (There was even a small, if vocal, group for Verazzano.) 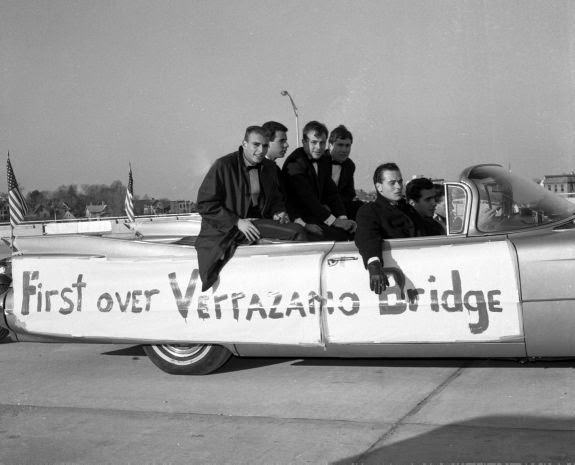 Official construction signs did say Verrazzano, in keeping with the traditional Italian spelling. However, despite strong support for the double Z version, the shorter spelling eventually won out. Although this would be one of the final great projects overseen by Robert Moses, it’s also the final project of New York’s great bridge and tunnel builder Ottmar Ammann. He died on September 22, 1965, less than a year after the bridge’s opening. Milton Brumer is sometimes overshadowed by those two great icons of city building, but the chief engineer of the Verrazano-Narrows had worked with Ammann on almost every one of his projects and was probably more involved in the day-to-day operations than his boss. In total, there were 200 engineers employed on building the bridge, on top of the hundreds of construction workers employed to bridge the Narrows. 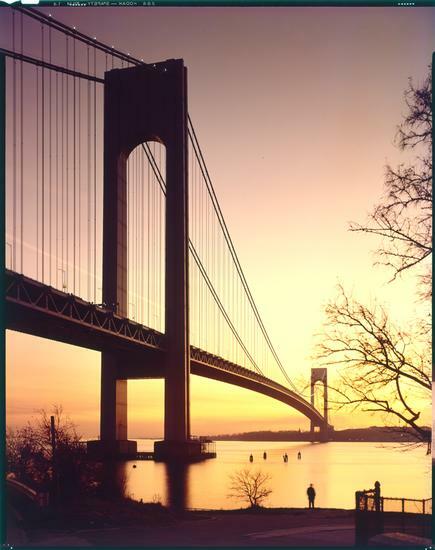 When it opened on November 21, 1962, the Verrazano-Narrows Bridge was the longest suspension bridge in the world, so long, in fact, that bridge engineers had to take the curvature of the planet into account in its design. As a result the tops of the towers are slightly farther apart than the bases. Or to put it another way, if the Narrows were drained, the towers would appear to slightly lean away from each other. 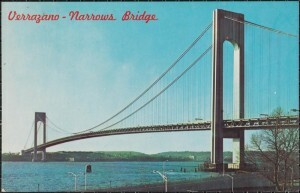 The Verrazano-Narrows Bridge weighs 1,265,000 tons — the longest suspension bridge in the world at its completion, surpassing the Golden Gate Bridge — but was not the most welcomed neighbor to the areas of Bay Ridge and western Staten Island when ground was broken in August 1959. Many residents railed against its necessity, the displacement of businesses, even the constant noise assault. “That bridge — who needs it?” [source] Once construction began, however, many business owners benefited from the influx of hundreds of workers entering the area. Three workers were killed during the construction of the bridge, including young Gerard McKee who fell to his death in an accident which could have been prevented. His death sparked an improvement in safety procedures at the bridge. He’s memorably commemorated by Gay Talese, who closely documented the construction of the span in his classic book The Bridge. In building the Brooklyn anchorage, crews swept away the remainder of old Fort Lafayette, an entrenchment built during the War of 1812. During the Civil War, Confederates were held prisoner here, including Robert Cobb Kennedy, who attempted to burn down New York during the Great Conspiracy of 1864. During the two World Wars, it held reserve ammunition. Moses personally fought an effort to turn the fort into a night club and now had a hand in dismantling it entirely. 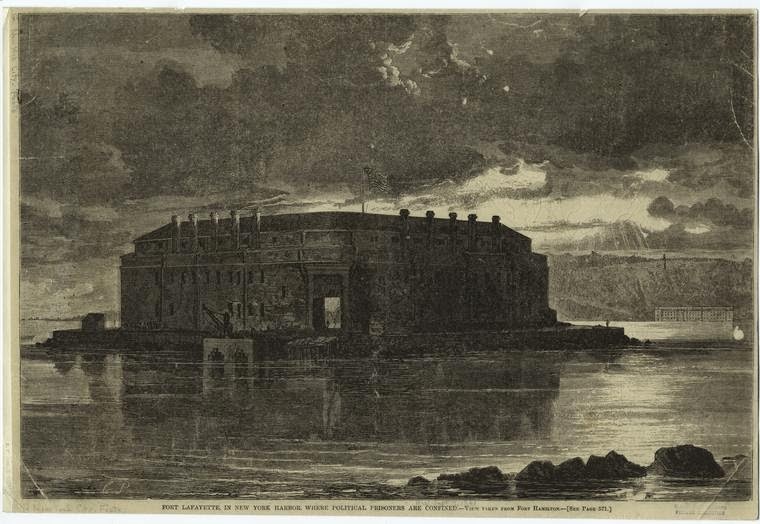 Not only was the fort destroyed, the entire island on which it sat was virtually erased. In addition, areas near Fort Hamilton and Fort Wadsworth were cleared away to make way for the bridge’s approaches. Perhaps to nobody’s surprise, the construction company tasked with clearing away the old fort employed the son-in-law of Robert Moses. Below: The bridge’s most famous film appearance in Saturday Night Fever — but don’t watch if you haven’t yet seen the entire film!